Radio Sausalito exists a public service and we rely on support from you and the community to keep us on the air. We don’t sell ads or hold pledge drives. (Thank goodness!) In addition to the PayPal donation link, there are a few items that we seek to have donated to the station. We will recognize you on the air if you’d like, as a small token of our appreciation. More importantly, your donation will help us bring great programming to our listeners.Donations of over $150 qualify for a free ccWiFi internet radio as a thank-you gift. A location for a repeater in the floating homes in Sausalito. A pair of “shotgun” microphones for broadcasting from the No Name Donated! Thanks, Eddie and Donald! 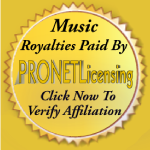 Streaming Music License for 2019 ($4,000+) – Our single biggest expense since the cost was increased 4x in 2016. To offer any of the items above, contact Jonathan Westerling, station president, at 415 332-JAZZ (332-5299). If you are moved to make a donation, any amount helps keep us on the air. Please use the Donate Now! page and Thank You!